Return of the 'peace process'? Justice Minister reveals that the two coalition partners agreed to form a common front 'against nationalism' amid spring election talk. "I have been holding conversations with Yair Lapid recently,” she told the newspaper. “I will say things here, to which he has given his consent." Danny Danon is a nationalist Likud MK who was fired by Prime Minister Binyamin Netanyahu from his post as Deputy Defense Minister after he criticized the government for being "limp” on Gaza, and for agreeing to ceasefires with Hamas terrorists even before the terror tunnels were dealt with in the initial stages of Operation Protective Edge. 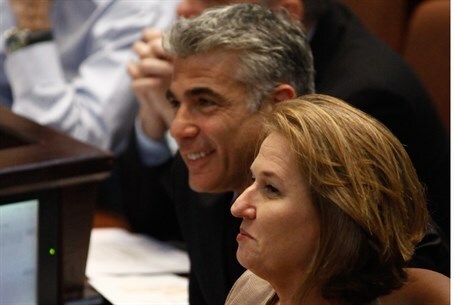 Livni said that Yesh Atid and Hatnua will also join forces on matters of religion and state, where they have pushed bills critics say oppose Judaism, such as a controversial conversion bill that Netanyahu recently shot down - in what is reportedly part of a push for spring elections. The move all but cements Yesh Atid's lurch leftwards in general, after an election-time pact with the right-wing Jewish Home party fell apart amid recriminations over the issue of religion and state, as well as negotiations with the Palestinian Authority. Yesh Atid is not predicted to do well in the next elections - with most polls estimating it will lose 9 of its current 19 seats - and a shift towards the left may signal an attempt by Lapid's party to consolidate its core of secularist, center-left voters.